Here comes May and that was April. 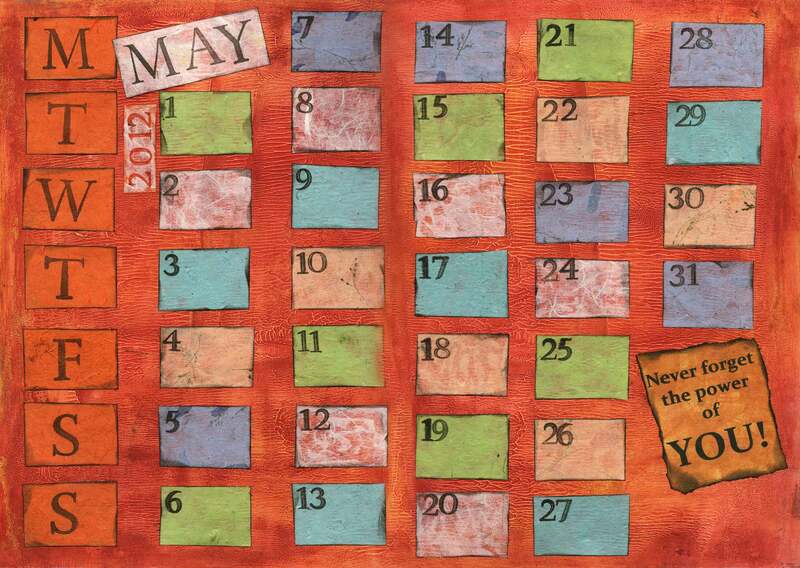 Here is my calendar page for May all ready to go, I’m excited because I think it’s going to be a good month. April was apparently the wettest on record. I know they say ‘April Showers’ but this was more like a monsoon at times. It’s ironic because much of the south of England is currently under a drought order which basically means the use of hose pipes, sprinklers, etc. for domestic purposes is banned and we are being encouraged to be careful not to waste water. People struggle to understand when we have had so much rain there is still a shortage of water, but two winters of less than average rainfall have left the ground water very depleted. Although a drought in English terms has no comparison to a drought in Africa. Here it means we have less water than we would like, in Africa it means there is no water. The truth is that most of us take water for granted. All my life I have been used to turning on a tap and clean water coming out of it. I am sure that if I had to walk for hours a day and had to carry the water I needed, which even then would not be clean enough to drink, I would still treasure every drop. 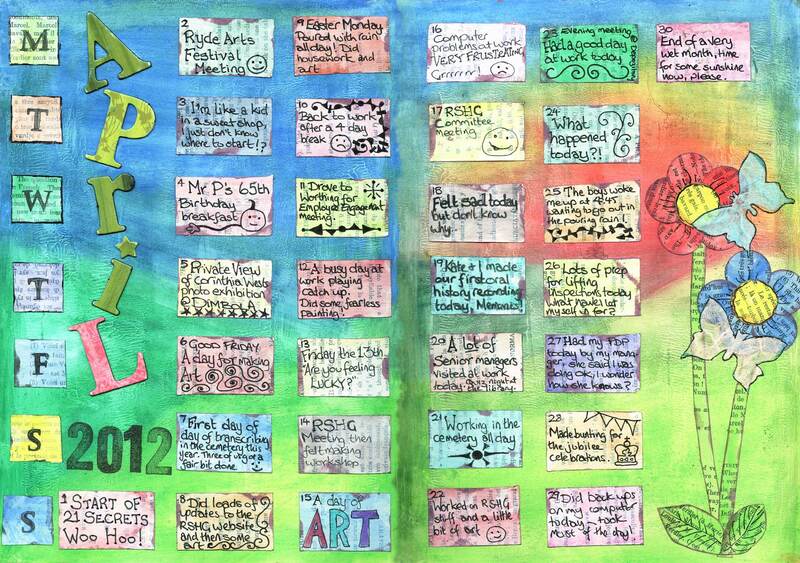 Below is my completed page for April. Tomorrow I will be posting my April (finished) and May (ready to go) pages for the 366 Calendar challenge, but I wanted to post something today, it being Sunday and my usual day for posting on my blog. So here is some bunting I made yesterday for the Jubilee Celebration event Ryde Social Heritage Group is holding in the Heritage Centre in Ryde Cemetery on 26 & 27 May. I bought some blank cardboard die cut flags and a pack of Portobello Road papers from Papermania and I got some Union Jack material and some red ribbon from the local habidashery shop. 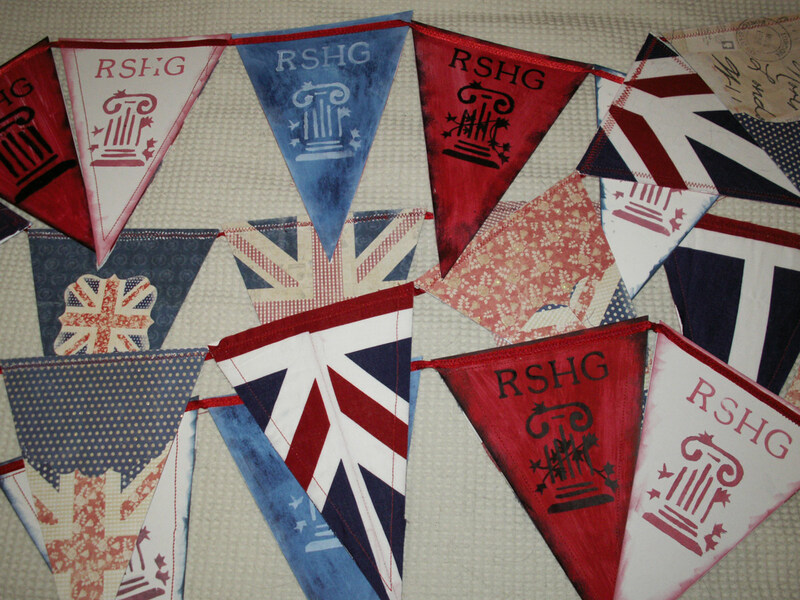 I painted one side of each flag in either red, white or blue acrylic paint and added the RSHG logo. At first I tried to cut a stamp of the logo from an old mouse mat, it wasn’t bad, but not good enough so finally I cut a stencil and I stamped RSHG on all the flags and then inked the edges. Then came the fun part – decorating the front of the flags with either material or paper. My mum gave me her sewing machine a while ago and that made everying so much easier. I am pleased with the results although I am a little worried that the cardboard will rip where the machine needle has made holes. The bunting is for indoor use only. We are having the kind of weather that makes people complain, high winds and lots of rain. I really don’t mind this kind of weather because it means I can stay in my art room all day and not feel guilty that I should be outside enjoying the sunshine. It’s a wet and windy Wednesday in the UK. The cats got me up at 5am today. The fact that the wind and rain were battering at the windows but Jack made it perfectly clear he wanted to go out (my cats are generally ‘fair weather cats’). I knew he wanted to go to the toilet and I put him in the litter tray about 10 times and tred to encourage him to use it, but he was having none of it and instisted I opened the door. Jack really does not like using the litter trays at all whereas Bill is quite laid back about it, in fact Bill sometimes comes in from the garden just to go to the toilet! But if Jack was going out so was Bill. At 5:30 I relented and let them both out. They were both back in the house within 5 minutes, presumably having done their business outside. It was too late for me to go back to bed then so I caught up with some emails before getting ready for work. Now at 10:30pm, after a day at work, I am really tired and off to bed soon. The spread above was done very quickly. The pages were already gesso’d and had some paint on them. I stuck down some ripped book pages and some images of old typewriters I found in a magazine at work the other day. I painted over the top with gesso and some lovely russet acrylic paint, which I then wiped back, and the text is made up from some stickers I bought from the bargain bin at Hobbycraft the a few weeks ago. I’m not sure you can read the text, it says: “The story of your life is exactly as you write it” which is another message to myself about the choices I make. Just like the art this post was done in a rush. Warning: the last two sentences of the third paragraph are a bit rude, so please don’t read that paragraph if you are easily offended. I hope you are having a good weekend, I am and I am also managing to get a few things done so that’s good, it eases the pressure a little. The lunch time chat was really more of a case of ‘the troops’ complaining about how things are run and some of them were quite aggressive. All the managers acted very professionally, were very reasonable and promised to look into every complaint. It remains to be seen whether or not they actually do. After a couple of hours they said they had to go back into their meeting and asked if anyone had anything else to say. No-one said anything and I thought ‘someone needs to say thanks to them for coming here today’, so I forced myself to say something. As soon as I started speaking a felt a rush of blood from my feet to my head, I was hot, felt like my face must be the colour of a beetroot and my voice was really shakey, to the point where I almost couldn’t get my words out. I did my best and I hope it was good enough. 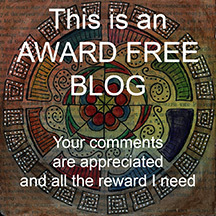 I think it’s important when people make an effort that they are acknowledged and thanked. It’s one of the complaints we make about our bosses – they never say thank you to us. Enjoy the rest of your weekend and I’ll be back soon. It’s a wet, windy and dismal day here on the Isle of Wight and I’ve been struggling with a low mood, actually been on the verge of tears a couple of times, and I have no idea why. I’m not normally a depressive person but I let things at work get to me today. Two days of having computers not working hasn’t helped because it has put me behind with stuff. I have let other stupid little things get to me too. 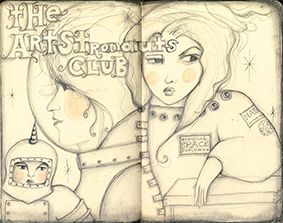 This spread is from my 6×6 journal. I started with a smooth gesso’d background, painted it with a brown acrylic then collaged some ripped vintage pages (that Alicia from Altered Bits sent me) and some scraps of old maps of my town. I don’t actually use the real maps, but scan them, print them on photographic paper and age them with tea so they look like the real thing. Then I used some blue acrylic paint and some white ink dabbed through punchinella and wrote the quote (in my poor handwriting) in white ink and highlighted (or do I mean lowlighted it) with black. I have become aware recently how much people look at the past through rose tinted glasses. Especially at work, things were always better back then, in the Good Old Days, although when that time was differs from person to person. I also know that rather than aching for the past and what was, we should all try and live more in the present. As Oprah says, “this moment is the only one you know you have for sure”. So we’d better enjoy it. Thanks for listening, just putting this all down has helped me to lift my mood, I think tomorrow is going to be fine. I am really enjoying the weekend and hope you are too. We had a fantastic meeting of the local history group yesterday and afterwards I went to a felt making workshop to help make squares for a ‘Friendship Quilt’ that will be displayed in Ryde Library for Ryde Arts Festival at the end of June beginning of July. I made two squares that were only ‘squarish’ ha, ha, ha. Lovely group of people and we all had fun. 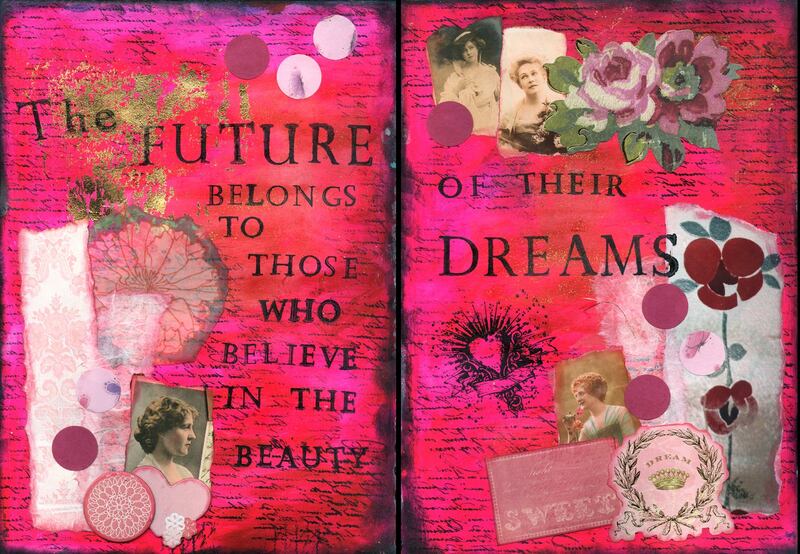 The spread above was made late last year for 21 Secrets 2011 in Tamara Laporte‘s workshop called Collage Paint Soul. Do you know about Tamara? She is lovely, check out her blog. My journal page already had Adirondak Colorwash spray on it from where I had put a wet stencil between the pages and I collaged scraps of paper with inked edges on top, and two images cut from a magazine to make up a girl. Then I painted over the top with acrylic paints and stamped with various stamps including a Tim Holtz number stamp and I also used some glitter glue. 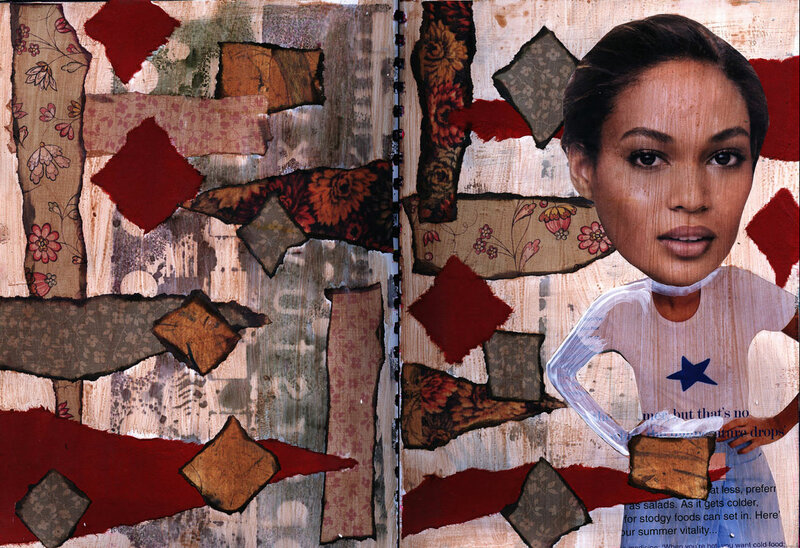 The thing I loved about Tamara’s workshop was learning that you can take a face from a magazine and paint over it. I am hopeless at drawing people and faces, and clearly I need more practice, but this is a good way to learn. I know the head is far too big for the body, believe it or not that was intentional. 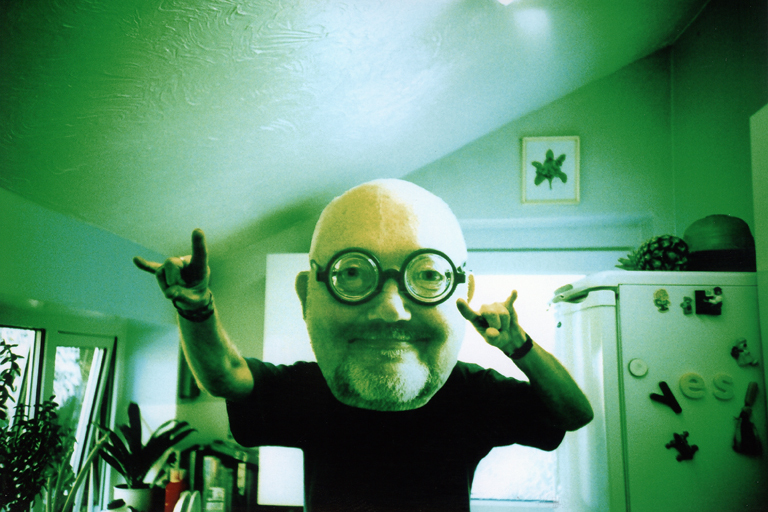 Years ago I did an photo/art project called ‘The Big Head Project’ it involved taking photos of people’s faces, printing them out super large on my printer, cutting the face out and sticking it on cardboard to make a mask and then taking another photo of the person with the Big Head. Here is an example, the colours look odd because the film was cross-processed. That’s all for now, I’ve got to get on – places to go, people to see, things to get done. I hope everyone is good and fine today. 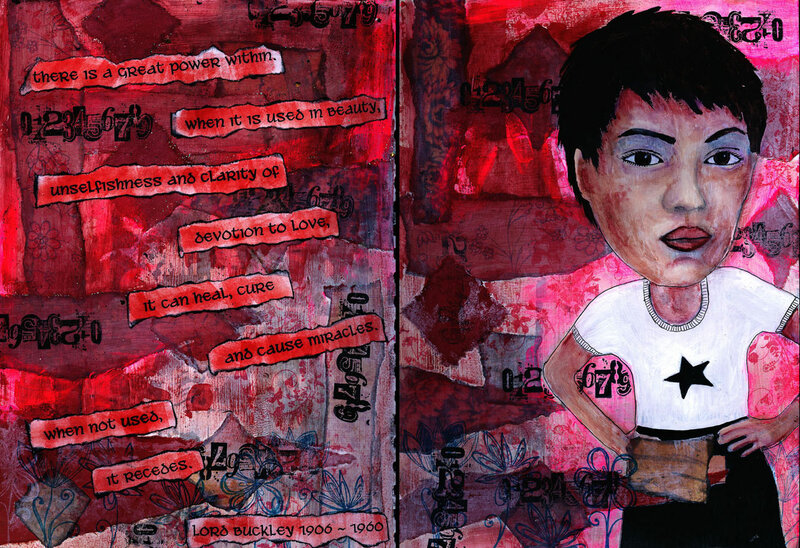 On this spread, in my 6 x 6 journal, I gesso’d the pages, then painted with acrylic paint. I collaged a ripped up Daffodil bag I picked up at the local garden centre. You were supposed to fill the bag with bulbs and buy them but I only wanted the brown paper bag. There is also a little bit of artist tape I made following my friend Carolyn’s instructions. Pop over to Carolyn’s blog A Colorful Journey to find out more about making your own tape – be warned though it’s addictive 🙂 The flowers are die cut baby wipes I had used to wipe back paint on other pages. The font for the text is called “Jellyka Delicious Cake” it’s a free font I found on the internet. I’ve been practicing my writing skills but I’m still never really happy with my own handwriting. I think the black shading is a from a set of cheap oil pastels I bought. They are not good so this week I ordered some Portfolio Oil Pastels and I am hoping I will have more success with those. My life is hectic again at the moment. I have a meeting this Saturday I need to prepare for – including writing a report and transferring a load of photographs into a presentation for our guest speaker, but this evening my computer decided to go sloooooooowwww and it took several hours to sort out. Mind you while it was running System Mechanic and fixing the problems I was able to do some art so I shouldn’t complain should I?